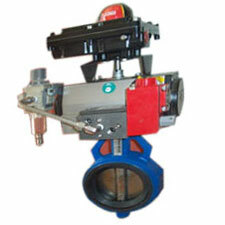 AMTECH Butterfly valves can be operated with Double acting / single acting pneumatic actuator , with limit switch and solenoid valve 230 v ac or 24 v dc. Our Butterfly valves are widely used in automatic /automation plants in water, process industries and marine for chemical and corrosive duties. We offers a range of valves with specially designed for pharmaceuticals, foods & beverages.